What is the One Million Pillowcase Challenge? I own a quilt shop, how do I sign up? You can sign up on retailer section of this site, or click here. When will I receive my marketing and promotional materials from American Patchwork & Quilting? A marketing kit with a press release, media pitch letter, and event ideas is available in the retailer section of this site. Every year in late January, we will mail a kit with posters, table tents and more. Click on Find a Shop to find a participating retailer near you. However, if there is not a participating shop in your area, we encourage you to make a difference by creating pillowcases and donating them locally. Don’t forget to update the pillowcase counter on the homepage. Where do I find the pillowcase patterns? Patterns are available here. Two new patterns will be added each quarter. Can I design my own pillowcase? Yes, creativity is encouraged. Keep in mind, however, the intended recipient’s age and comfort. Please check with your intended charity before choosing fabrics. Most charities we have contacted prefer 100% cotton fabrics. What do I do with my pillowcase when it’s finished? Click here for a suggested list of charities. How do I report how many pillowcases I made? The official pillowcase counter on the homepage will keep a running total of all the pillowcases donated to date. 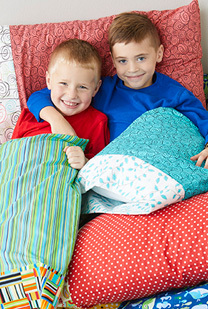 Sign up and enter the number of pillowcases you’ve created and donated by clicking here. To download step-by-step instructions on how to update the pillowcase counter, click here. Or simply email us at millionpillowcases@meredith.com with your count and we’ll add it for you! Should I send you my completed pillowcases? No. We want you to make a difference in your community. Click here for a suggested list of charities to contact in your local area. How long does the One Million Pillowcase promotion run? We are committed to getting to the goal of one million pillowcases. If this is still up, we are still going! How do I contact American Patchwork & Quilting with questions? Please email your questions to millionpillowcases@meredith.com. I have a blog. Can I promote the One Million Pillowcase Challenge on my blog?